Secret book clubs with an awesome name and ultra cool hide-outs and exclusive membership and activities bordering rituals- how awesome is that?! Mr Penumbra’s 24-Hour Bookstore is definitely an interesting tale of book lovers, book societies and books! But that’s not all that is discussed. A more pressing issue of ebooks vs physical books is also shown along with the part played by mega corporations which ultimately lead to the decline of the culture of reading and buying books. 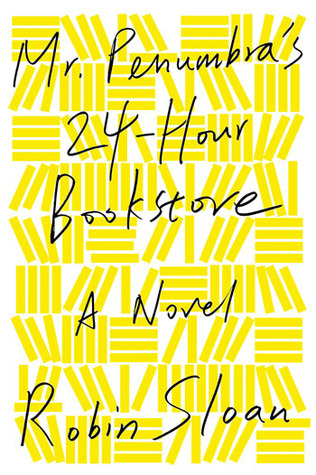 Why did I like Mr Penumbra’s 24-Hour Bookstore? I think it’s because the writer has taken our world and the world of books and has created a world in between -a world where you can just barely see all the others coinciding and overlapping each other. I just loved the feeling this book gave me- it was inspiring because (this might sound very weird) after reading a book about books, I found myself loving books even more and totally motivated to read tons more! The idea of writing a codex was intriguing and I found myself toying with the idea and concept that the writer had presented. All in all, this book was really good- not as exciting as you’d think it is, but still satisfying and overall, extremely realistic- a quality not many fictional books seem to be able to pull off *cough*.